Beautiful card! love these silhouette images! Weeds and wildflowers! A great outlook for life! Your ribbon flag and embossed layers beautifully compliment your pretty wildflowers! I think your card turned out great, so if it's better in person it would knock my socks off... Oh wait! I'm not wearing socks because I'm home sick today. Yeah perfect timing for this hop! That sentiment reminded me of a blog I was just reading that presented a recipe for natural flea repellant that used dandelions. Oh, how pretty and elegant Melissa. Love the silhouette image with black and white... the embossed background looks great. So glad you joined us in the hop. I can believe it is a gorgeous card in person! I can see all the hints of shimmer and shine...so wonderfully special! 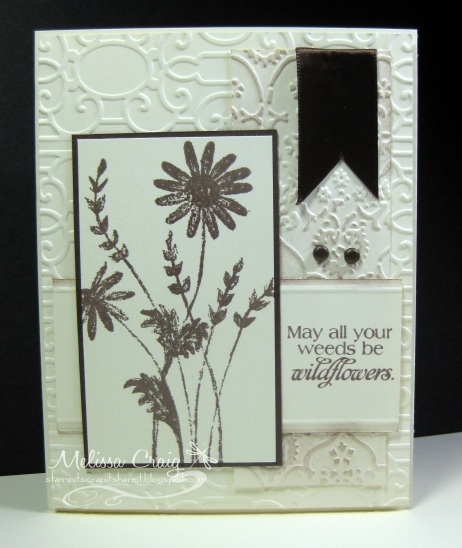 Keeping the colours neutral really makes this card very elegant. Love this stamp set! Thanks for sharing your pretty card! This is so pretty! I love this set you've used! Wonderful embossing folder! fabulous color combo...love the embossing! Very pretty card--I like the sketch. I think this is stunning -- so elegant! Wow, what an elegant card Melissa. Just gorgeous! What sweet words from your heart in this blog post!!! Beautiful card! Love the ribbon banner!!! Gorgeous! This is really pretty!! I love the embossing!! I started on this hop but got sidetracked before I got to your card.